Skyline Hollowbody 30, 4-string bass guitar from Lakland. 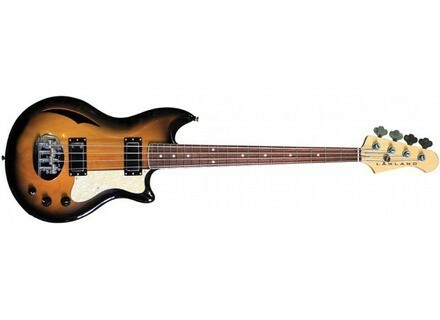 Lakland adds a new short scale Skyline Hollowbody bass to its catalog. The Lakland Skyline Hollowbody 30" scale length bass specifications are similar to the 34" scale original instrument, with a carved mahogany body, a carved maple top with one F hole, a maple neck and a rosewood fingerboard with 20 frets and Dot inlays. The nut width is 1.5". The bass is equipped with two vintage single coil pickups, two volume and one tone controls, Hipshot tuners and a Lakland bridge. The Lakland Skyline Hollowbody 30 will be available in the USA for $999 (public price). More information soon on www.lakland.com. Aria introduces the IGB-Rosie Bass Aria adds to the IGB series the Rosie bass which includes with a rosewood top. Ibanez launches two BTB Premium basses Ibanez adds to its BTB bass series two new five and six-string Premium models, available in a unique Vintage Natural Flat finish.